In an effort to help victims in Haiti from the recent devastating earthquake, the Florida Renaissance Festival will accept food donations on January 23-24th on site. Guests who bring in three or more non-perishable food items will receive a coupon for $3 off a one-day adult pass. All items collected will support the efforts of City of Miami Commissioner Marc Sarnoff and Camillus House who have partnered to provide emergency relief to the victims of the disaster. The Florida Renaissance Festival is produced by the national, award winning Bobby Rodriguez Productions and strives to create an entertaining and cultural opportunity by making Renaissance history come to life for both children and adults. The event is hosted by City of Miami Parks and Recreation Department and Historic Virginia Key Beach Park. The Florida Renaissance Festival at Historic Virginia Key Beach Park will be open this weekend January 23-24th from 10 a.m. to sunset. Prices range from $20.00 for adults and $7 for children ages six to 11 years old and children under five are free. The Florida Renaissance Festival in Deerfield Beach has been seen by more than one million people in South Florida. This 16th Century production features more than 100 costumed performers and stage acts from around the world. For additional information, visit: www.ren-fest.com, follow on Twitter: @flarenfest or find them on Facebook: The Florida Renaissance Festival. …Born aboard an airplane that left London during World War II, she grew into an intrepid woman who traveled the world and had a reverence for both history and whimsy. She was an educator, bookstore owner and she and husband Ken Engle founded of the delightful Shrewsbury Renaissance Faire (OR) in 1996. It was held each September, first at the Philomath fairgrounds and since 2002 in picturesque Kings Valley. Ken died in 2004, at 57. We're sad to say that Leslie Engle, who relished her nickname,"The Shrew," passed from us too soon when she died Oct. 16 at the age of 66. 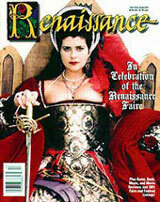 However, her family has pledged to continue the legacy of the Renaissance Faire as living history. It is scheduled for Sept. 11 and 12, 2010…. It might be more appropriate for people to hear the news about July 19’s Prepare for Faire from a town crier instead of a newspaper. The event is a yard sale — if a yard sale took place during the Renaissance and benefited multiple sclerosis research. For sale will be a plethora of Renaissance-style "faire" like dresses, mugs, blades and boots all to help area locals prepare for the Maryland Renaissance Festival later this year without breaking their wallets. SHELBY IS A member of Team Wench a group of mostly women who help raise money for research into multiple sclerosis and other fatal diseases. Shelby, who has been diagnosed with MS, along with two other women who wanted to find a way to raise money for research founded the group seven years ago. They were also Renaissance lovers and so melded the two passions into one. "For some people [dressing up for the festival] is an actual warrant to follow the historical side of it; for some people it is a theater aspect and for others it’s just about escapism. For me I started getting into Renaissance-type things a number of years ago because I loved the historical costuming of it. People want to see something that isn’t modern, something that isn’t every day," Shelby said. Chris was involved with the Renaissance Faire in Chippewa Falls as the “town scribe” and was instrumental in developing the “Kids Kingdom.” She loved her Faire family. Richard Helgerson, 67, a leading scholar of Renaissance literature and a UC Santa Barbara professor of English for most of four decades, died April 26 after a long battle with pancreatic cancer, according to an announcement by the Department of English. Helgerson, who began teaching at UCSB in 1970, was known for, among other things, his studies of the ways in which the earliest European nation states described themselves to themselves and to the world. Helgerson was the author of six important books, including an edition and translation of the French Renaissance poet Joachim Du Bellay, and more than 60 articles and reviews. His most influential publications were "Self-Crowned Laureates," a major study defining the distinctively Renaissance career patterns of three major English writers - Edmund Spenser, Ben Jonson, and John Milton; and "Forms of Nationhood: The Elizabethan Writing of England," on the early discourse of nationhood. Published in 1993, "Forms of Nationhood" won multiple scholarly awards, including the British Council Prize for the best book in any area of British studies and the Modern Language Association James Russell Lowell prize for the best book in any area of literary studies. This book in particular established Helgerson's international reputation as one of the leading Renaissance scholars of his generation. Linn County officials are considering locating a base for a Renaissance fair as a way to pay for operation of a new 175-acre county park. The county already has borrowed from its road fund to pay the landowner the $1.25 million for the property west of Seven Mile lane and south of Highway 34. Royal came to Linn County with a similar plan for a faire at the defunct Washington County Fairgrounds bogged down. The park/faire idea is appealing because it’s being sold as something that won’t cost Linn County taxpayers any general fund revenue; some of the revenue from the faire would do that…. My name is Dee Gaylord, and I read with interest that there are plans for a new Renaissance faire in Oregon. Well and good; it is nice to know that people are enjoying that sort of family-friendly venue. However, in your article [Corvallis-Gazette Times], it said that there are “no faires in the Northwest.” This rather surprised me. I work for the Shrewsbury Renaissance Faire, in Kings Valley. This faire has been in existence for 11 years. It has, as I remember, an attendance of about 20,000 (give or take a few thousand), and it has won awards from the Oregon Festivals and Events Association as well as the International Festival and Event Association. We have performers, vendors and a joust. These people come from all over the United States. We even have one or two of our “guilds” (working groups of Shrewsbury), that are located out of state. We have attendance of people from several countries, as guests. As I recall, I have seen write-ups of our faire in your newspaper, as well as our advertising. Therefore, I really would appreciate it if it were acknowledged that there is a renaissance faire in the Northwest! Only $25 for 6 issues!